Pergolas, arbors and other home additions can add value to your home while creating a pleasant and relaxing environment. Backyard Living can create a great escape for you, all in the comfort of your own backyard. You’ll be able to take advantage of the extra space and comfort that an outdoor area can provide. 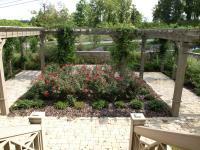 Pergolas can add a beautiful focal point to any garden or landscaped area. Let us change your backyard into the yard of your dreams.